Chapters Of My Life album cover. Moken's voice is a recognizable deep baritone whether he’s singing or answering the phone. During his early years in Limbe, Cameroon, the artist ran a do-it-all art space where he simultaneously worked on clothes, songs, drawings and everything in-between. A sudden migration to the U.S. saw Moken land in Detroit, where he lived in his car while spending stints in-and-out of college and trying to acclimate to American life. All of these experiences shape Moken's debut Chapters of My Life, an album whose main focal point is the Cameroonian singer's resonating baritone voice. We caught up with Moken—who describes himself as an "avant-garde afro pop artist and balladeer"—over the phone to talk about his youth in Limbe, his tumultuous move to the U.S., and his new album. Read our chat and hear our premiere of Chapters of My Life's "Wild Wild Ways" below. So you started out as a fashion designer in Cameroon? Moken: I had an art studio, so not like a confined fashion designer. In my studio I did people's commercial signs, screen printing, just created stuff. Some people would come with their jeans and I would just draw little caricatures like Minnie Mouse and Mickey Mouse on them. It was also my music studio. I was there with my guitar all the time so friends and musicians would pass by. You then moved to the U.S., how did that come about? One afternoon, I'm coming back to the studio with my guitar from a bar and somebody tells me that there's a call from America. It was my sister. She's like, "You've won the Green Card lottery, get ready you have to come to America in 6 months." I hadn't even dreamt of going to America in the next 10 or 15 years then, all of a sudden, I'm preparing to head there. It was a complete turn around. It was almost surreal. I found myself in the big commercial city of Detroit. There was this art college that my sister knew—the reason for her putting me in that Green Card lottery was because she knew that my life in Cameroon was all about art—and I think the next week after I came to the States I was going to that school for registration. During that time I had to work full-time and go to school full-time. It was a very demanding so I dropped out of school for a little to focus on my music. When I eventually decided to go back to school, the fees had skyrocketed to almost $20,000 a year. I was like, "what should I do here?" There was no way I could afford that. So my car became my home. I was living in it. When I picked books from the library I would arrange them in the backseat. Nobody in school knew that my car that was parked by the playground was my where I lived. I wrote a lot of the songs for the album while living in my car, it's where I came up with all my best ideas. It was almost like a kind of blessing. Can tell us about the background of "Wild Wild Ways"? "Wild Wild Ways" is a very serious song. The core message is about those who dominate our world. In the wilderness, the lion is the king of the wild wild ways. The wilderness is this world and the lion is those who make the rules in life—the presidents, the U.N., all the big organizations, the bankers, those who give loans to people. It's a serious message to the rulers of the world: what you give is what you get. Who inspires your songwriting and singing? The inspirations on my singing begin with Francis Bebey, most of his songs were like poetry to me, they really affected my spirit. Then there was Manu Dibango, he has this kind of poetic way of talk-singing and I picked up some of that desire. That and a little bit of Fela—he did a lot of talk-singing too. There's also Miriam Makeba and Van Morrison, whose voice invokes some out-of-this-world imaginary lines in my mind. I noticed that Francis Bebey had this baritone and people like Nina Simone had this kind of high-pitched resonating voice. So when I started my singing, I tried to sing like them, with a high baritone thats ends on a high-pitch or falsetto. What Cameroonian styles are reflected in your songs? My style's more of a melting pot. The Cameroonian style that I think is in my music is classical makossa and then a little bit of afrobeat. It's makossa but with a very jazzy, rhythmic touch. When I write a song, I feel like an African drum is beating in my head and then I just mix that feeling with any influences, even Western influences from James Brown and Nat King Cole to Detroit rock. 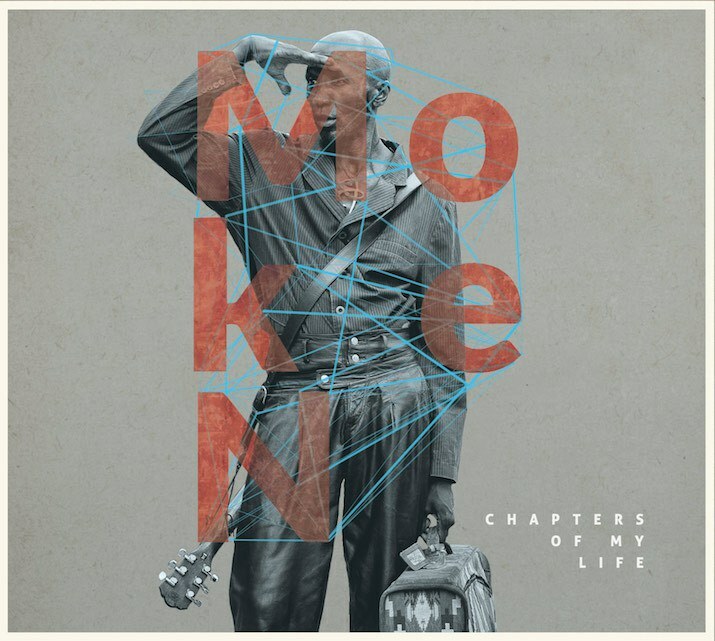 Moken's 'Chapters of My Life' is out April 6 on Bantu Records.